Body mass index, also called BMI, is a calculation of a correlation between a person’s height and weight that categorizes him or her as underweight, of normal weight, overweight or obese, assuming a normal body composition. 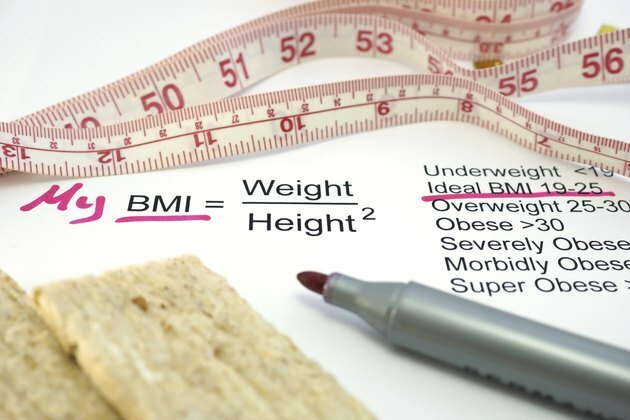 Underweight is considered a BMI of 18.4 or lower. A BMI of normal weight is any number between 18.5 and 24.9. The overweight range is between 25 and 29.9, with anything above that being considered obese. Maintaining a low BMI is important for normal health, growth and functioning of your body. According to the Centers for Disease Control and Prevention, or CDC, if measuring in pounds and inches, the formula to obtain your BMI is to divide your weight by your height squared and multiply by 703. For example, a person who is 5 feet 4 inches tall that weighs 160 pounds will first convert her 5 feet into inches and add the 4 inches to arrive at a total of 64 inches in height. The equation then becomes the product of 160 divided by 64 inches squared (160 divided by 4096), multiplied by 703, which equals a BMI of 27.46. Naturally, one of the main benefits of having a normal BMI would be that of maintaining a healthy weight. Maintaining a normal BMI will require a person to eat well-balanced meals and exercise regularly, which will further increase overall health. Being of a healthy weight has many benefits, such as looking and feeling better, as well as increased confidence and energy. The CDC states that overweight and obese people have an increased risk of suffering from heart disease, stroke, some cancers, type 2 diabetes, joint problems, chronic inflammation, and various other health conditions. To obtain or keep your low BMI, you have to eat well and exercise. In addition, a healthy body weight makes a more fit body and a more lifestyle more attainable and maintainable. Even though the BMI calculation does not take into account actual body fat percentage, it is more than likely that if you’re in the normal weight zone, you are going to be happy with how you look. For most, when you are happy with how you look, you will want to stay that way. With confidence comes a better outlook on life and overall happiness in your day-to-day life. What Does a 35.1 BMI Mean?